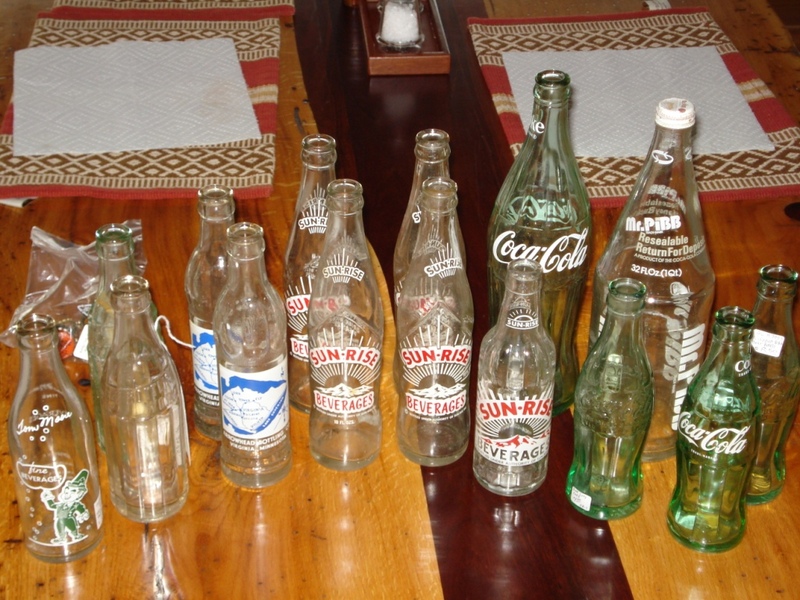 Coca-Cola Bottle Man's Blog | All about Bottles! How About a Coke? Book Now Available….. Since then I was able to meet the author in person, Frank Barron Jr. He spoke at a recent Coca-Cola Collectors Club event and was well received. The Barron family was a long time Coca-Cola bottler in Rome, Georgia as well as being involved in several other bottling plants around Georgia. This is a personal look into bottling, the early years up to when they sold the business (and why they sold the business). It has some very interesting details of bottling and puts a personal spin on it. I think it is a book worth reading if you want to learn more about the bottling side of the business or just for some good detailed information on this North Georgia bottler. A great book and I am so glad to see it available again. I’ve ordered a few copies earlier today, one for me and a few extra as gifts. I am sure many of you have watched American Pickers at some time or another. I watch it when I can. I enjoy seeing Mike and Frank checking out items across the U.S. Wish I could make a living doing that! 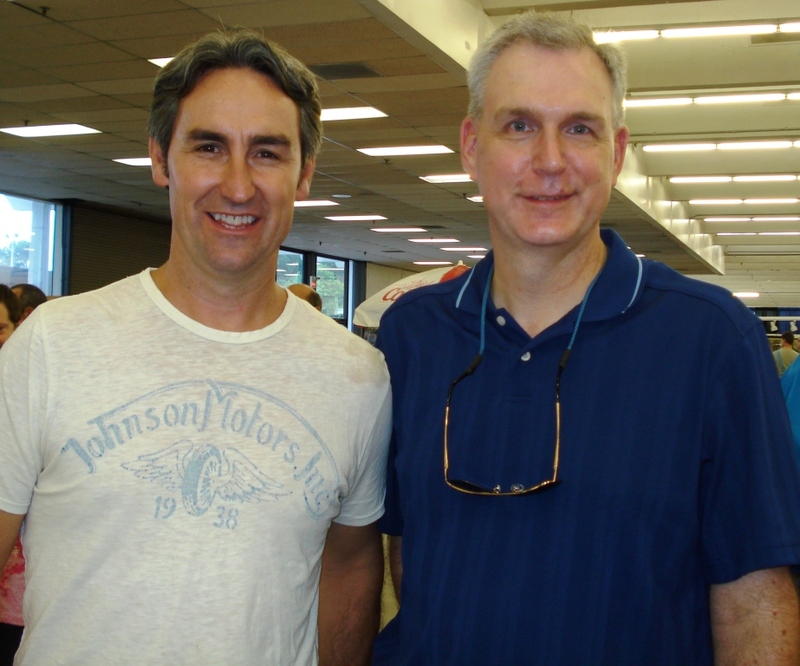 I saw Mike Wolfe over the weekend. He was at Scott’s Antique Market on Saturday here in Atlanta. I actually saw him on Friday too. I gave him a copy of my book ‘The Coca-Cola Bottle’. I thought he might find it an interesting read. He liked the book. I only had a chance to speak to him briefly, but enjoyed it. Here we are at Scott’s Antiques…. At some point over the weekend I hit the 80,000 mark for visitors. Thanks everyone for stopping by and thanks for ALL the questions! Seminars on Wednesday included “How Do They Know That?‟ with Bill Bateman and Randy Schaffer who brought their vast Coca-Cola knowledge and shared it with everyone. Also a “Cooking with Coke‟ seminar featured a live cooking show with samples for everyone to try. Also on Thursday the seminars continued with “What‟s it Worth?‟ using items that were placed in the auction. And me, Doug McCoy held a seminar on “Products of The Coca-Cola Company‟. I talked about Fanta, Sprite and some lesser known products such as Sugarbush, Raintree and Chime. Friday was taken up with the auction. Over 400 items came up for sale. Saturday we had the Memorabilia Sale that was also open to the public. Saturday evening ended with the Banquet. A great week! One thing that goes on every night at the convention is a strange activity called ‘Room Hopping’. I guess I had better explain that. Many people bring items to sell at the convention. They have item that span the globe as well as time. You will have things from Belgium, Japan, etc. and find items from the 1880’s to current. In order to show these items, we will set up our hotel room to display and sell the items. We prop open our hotel room door, people will walk in and out of the rooms. 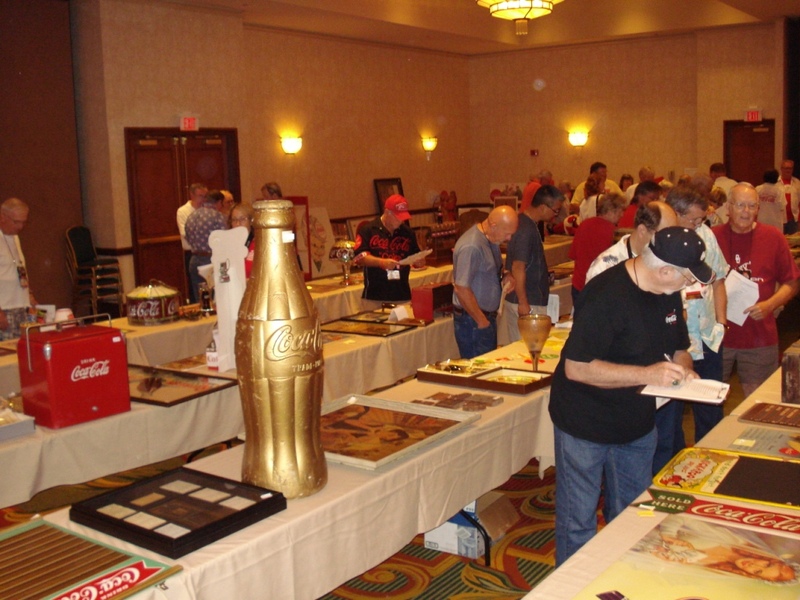 It is a great way to see who is at the convention, meet fellow collectors and find that item you may be looking for. It seems like a strange practice at first, but not for long. One activity at the Convention was a Silent Auction. Club members are allowed to put a few items into the auction. The Club takes a small fee from each sale to help defray the cost of the Convention and to allow the Club to meet its expenses. The auction will start at a set time, but you don’t know when it will end. Each item has a bid sheet placed in front of it. You walk around the room, find an item you like, write in a bid and your registration number. Then walk away and hope someone doesn’t come in behind you and outbid you. You continue doing this until the end of the auction is called. You don’t know when they might end it. There were around 40 or 50 tables of items. You can pick up some pretty good items at a silent auction as long as you are quick on your feet! 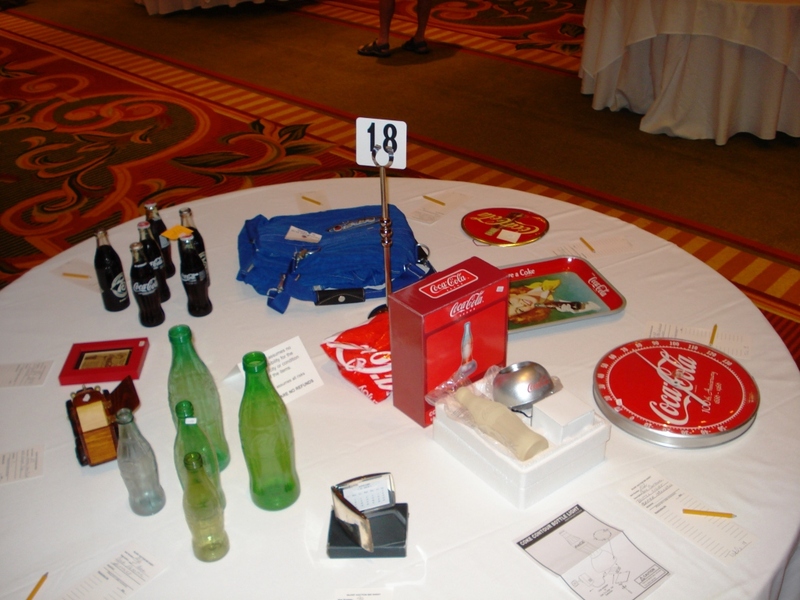 Here is a typical table at the silent auction. 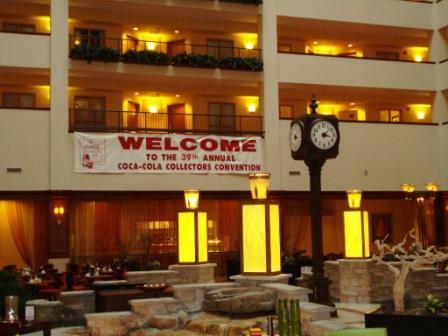 Just got back from the 39th Annual Coca-Cola Collectors Club Convention in Charlotte, NC. What a week! I am still trying to recover. Over the next few weeks I will blog about the Convention, what happened and post a few photos….so stay tuned. No Matter Where You Go….. I recently went to see family in Minnesota. We were way up north, a stones through from Canada. I figured I wouldn’t find much of anything in this semi-remote area. One rainy day we decided to visit a neighboring town. Came across a great little junk/antique shop PACKED with all kinds of items. I managed to find 15 bottles to add to my collection. Most were Coca-Cola related, but not all of them were. No matter where you go, you can find bottles of some sort. A few were from Ely, MN and Virginia, MN. Some good finds. We were able to visit, shop for antiques, fish, go boating, etc. It was a perfect vacation with family. 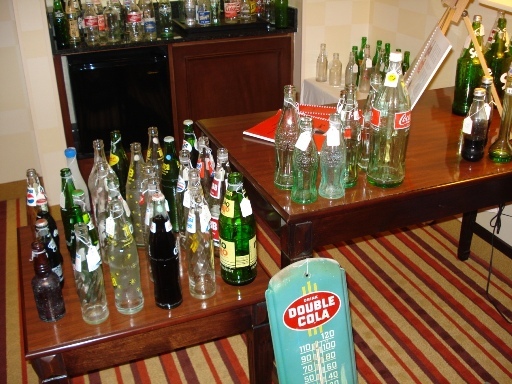 Last weekend was the Smyrna Antique Bottle Show. I was able to go, took my camera and did not take the first picture. Got busy talking to a lot of bottle collecting friends and checking out the bottles. I enjoy seeing everyone, finding out what they have found lately and see what is the newest trend in the bottle collecting world. It was a great time. I did find some screw on metal Coca-Cola caps. They are hard to come by, and I like having nice caps on my bottles. I also found a few bottles for upgrades. They had less case wear than what my bottles had. So at least I found a few bottles. While searching the web today I came across this article by accident. A very interesting read on the history of Laurens Glass Works. Finding articles like this help with identifying marks on bottles and what they mean. I found a little tid-bit of info at the end of this article about the meaning of the glass makers mark that look like L* and L**. Also it discusses a strike by the glass workers in the late 1960’s, which I had been looking for information on. It is a great source and hope you enjoy reading it.